Let water continue to run for approx. 10 seconds after grinding is complete to flush plumbing. DO grind natural food waste with moderate flow of ambient cold WATER. DO grind materials such as vegetable scraps, fruit pits, egg shells, pasta, rice, meat scraps etc. DO dispose of coffee grounds in your disposer. DO flush the disposer for self cleaning. Allow the disposer and ambient cold WATER to run for a few seconds after grinding or draining the sink. DON’T put anything but NATURAL FOOD WASTE into the disposer, ie NO GLASS, STRING OR FEATHERS. DON’T GRIND OYSTER SHELL as the fine sediment may settle in the plumbing. DON’T USE HOT WATER when grinding. Using hot water wastes energy. DON’T PUT FAT, GREASE OR OILS DOWN THE DISPOSER OR ANY DRAIN. DON’T turn the disposer or the water off until grinding is completed and only the sound of the motor and running water is heard. DON’T use SOLVENTS OR CHEMICALS in the disposer. 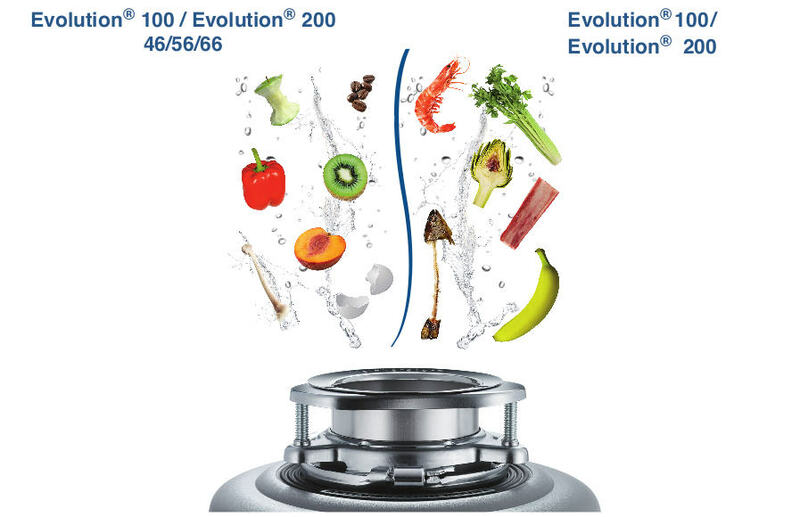 The Evolution® 100 and Evolution® 200 feature unique two and three stage grinding technology which enable them to grind STRINGY FIBROUS FOOD such as husks, celery, banana peel and onion skins.